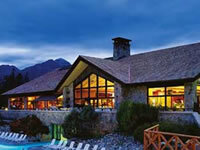 Hotels in Jasper range from humble and homely to grand world class resorts. Most Jasper hotels are either in the downtown area or close by on Connaught Drive or Geikie Street, while others are on the outskirts of town with more natural surroundings. All budgets are catered for and several Jasper motels include kitchens or kitchenettes, which make them perfect for people looking for more self contained accommodation. Hotels in Jasper Alberta tend to be more economical than hotels in Banff, making Jasper an attractive option for a longer stay. To help you find your ideal hotel in Jasper, we have put together a list of recommended lodging below. 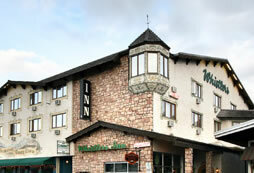 Maligne Lodge is a short stroll from downtown, and is one of 2 Jasper Alberta hotels operated by Decore Hotels. Like its sister hotel the Tonquin Inn, this property boasts a good variety of accommodations including several kitchen suites, as well as an indoor pool, whirlpool, free wireless internet, restaurant and outdoor patio. Located on the outskirts of Jasper, the Jasper Park Lodge enjoys an enviable lakeside location with outstanding views to Jasper’s most famous peak, Mount Edith Cavell. Easily the most luxurious hotel in Jasper National Park, the JPL offers a high standard of accommodation, spread throughout several log cabin buildings along the shores of Lac Beauvert. With an excellent selection of restaurants, bars and lounges, a world class golf course and an exquisite spa and health club, this is one of the hotels Jasper visitors return to year after year. The Tonquin Inn is a centrally located, pet friendly hotel in Jasper, Alberta. Offering a variety of guest rooms and suites, this property is well suited to families looking for spacious Jasper accommodation with kitchen facilities. The hotel amenities are impressive with a swimming pool, hot tubs, saunas, large fitness room, restaurant and lounge. Located on a quiet road, just 5 minutes from downtown Jasper. Choose from standard or deluxe rooms with mini fridge and tea & coffee making facilities, or kitchenettes with a separate bedroom and full kitchen. Public amenities include indoor pool, 4 hot tubs, sauna and steam room, family restaurant and guest lounge with mountain views. Located within walking distance of downtown, the Sawridge Inn offers well appointed, brightly decorated rooms, along with a good selection of restaurants and lounges. The Mountain Wellness Day Spa offers wraps, massage, and other beauty treatments, making the Sawridge Inn one of the few spa hotels in Jasper National Park. Located on a quiet street not far from downtown, the Chateau Jasper is one of the more upmarket hotels Jasper has to offer. Rooms are tastefully appointed in a mountain style and the Junior and King Executive Suites boast a sitting area and Jacuzzi tub. With the heated indoor pool, whirlpool, fitness centre and fine dining restaurant, this is certainly one of the luxury hotels in Jasper Alberta. Located on Jasper’s main street, just a 5 minute drive from the town centre, the Marmot Lodge offers clean motel style accommodation with standard and deluxe rooms or a selection of suites with kitchens. Amenities include Embers Steakhouse restaurant, fireside lounge, indoor pool, sauna and hot tubs. Just a 5 minute drive from downtown Jasper, the Best Western Jasper Inn & Suites offers several spacious and comfortable room types in a spectacular setting surrounded by views of the Canadian Rockies. Standard rooms benefit from a small fridge, and there are studios and suites with a kitchenette or full kitchen. Some units also offer a whirlpool bath and fireplace. All guests benefit from the indoor pool, sauna, steam room, hot tub, free high speed internet and guest laundry. The popular Inn Restaurant serves Canadian cuisine using local produce, and the garden terrace provides an outdoor option to enjoy your dinner in a natural setting. Convenient downtown location within strolling distance of Jasper restaurants and shopping. Choose between the economy room, standard room, or suite. Hotel facilities include 2 restaurants, pub, steamroom and outdoor hot tub.